90 minutes separate 1860 München from their comeback in professional football. Die Löwen were relegated from Bundesliga 2 at the end of last season. But a conflict with investor Hasan Ismaik meant that 1860 were unable to finance the licence for Liga 3 and were, therefore double relegated to the Regionalliga Bayern. It was a tough period in which the club was on the verge of bankruptcy. Despite all the difficulties, however, 1860 head coach Daniel Bierofka managed to put together a strong side that finished first in the Regionalliga Bayern with 83 points – nine points more than second-placed Bayern II. Winning the championship in the Regionalliga Bayern, however, does not equate with promotion to Liga 3. Often termed one of the biggest injustices of German football the champions of the five regional divisions (Regionaliga Nord, Regionalliga Nordost, Regionalliga West, Regionalliga Südwest and Regionalliga Bayern) have to play promotion playoffs to qualify for the third division. Hence, after dominating the Regionalliga Bayern for 36 games, 1860 München were drawn against Saarbrücken in the promotion playoffs. The draw was widely considered as one of the most difficult draws as Saarbrücken, like 1860 München, are a fallen Bundesliga giant that is now trying to force its way back to professional football. Unlike the Regionalliga Bayern, the Regionalliga Südwest is given two spots in the promotion playoffs – this is due to the larger amount of clubs in the region – and Saarbrücken dominated the 2017/18 season in the same fashion as 1860 winning their division with 82 points – eleven points ahead of second-placed Waldhof Mannheim. The Regionalliga Südwest, however, is widely considered more competitive than the Regionalliga Bayern. Alongside Saarbrücken former Bundesliga sides Waldhof Mannheim, Kickers Offenbach, SSV Ulm 1846 and Stuttgarter Kickers alongside former Bundesliga 2 regulars FSV Frankfurt TuS Koblenz, Hessen Kassel and SV Elversberg compete in this league. 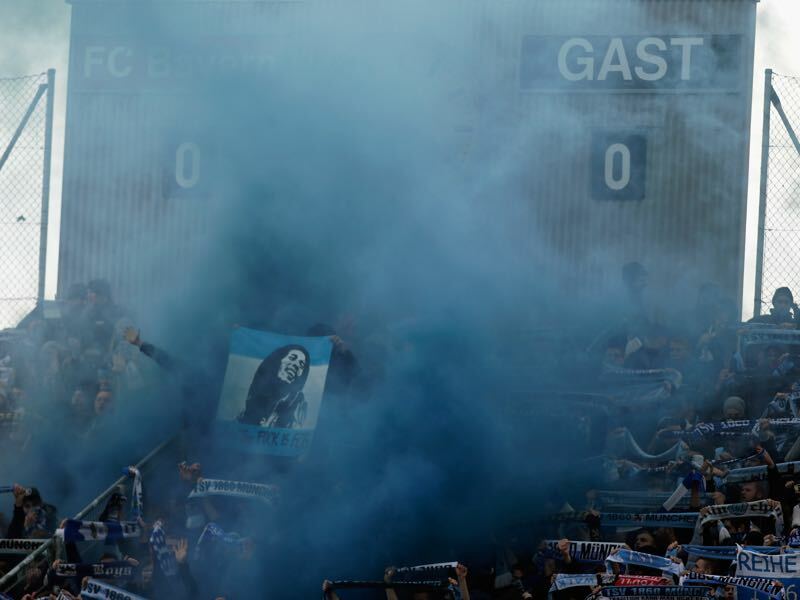 The likes of Stuttgarter Kickers, Frankfurt, Kassel and Koblenz even fought against relegation for much of this season. As a result, most 1860 fans were somewhat pessimistic ahead of the promotion playoffs. Die Löwen, however, started well into the first leg against Saarbrücken taking the lead in the first minute thanks to a goal by Sascha Mölders. Saarbrücken then also lost top striker Kevin Behrens, who received a red card after a brutal foul against Kodjovi Koussou. It should have been easy going from there for 1860 München, but Saarbrücken fought back and just before halftime Tobias Jänicke equalised for the Saarländer. Just after halftime 1860 made it 2-1 through Nico Karger but Saarbrücken goal-getter Patrick Schmidt equalised once again in the 75thminute. A 2-2 draw would have been an excellent result to take back to Munich. But hero Sascha Mölders then pushed the gate to Liga 3 wide open scoring 1860’s third goal in the 84thminute. Sascha Mölders is the Regionalliga Bayern incarnation of the Brazilian Ronaldo. Despite carrying a few extra pounds, the striker has been in legendary form for die Löwen scoring 19 goals and 14 assists in 33 games. Mölders was among the players that decided to stay at the club following 1860’s fall from the Bundesliga 2 to the Regionalliga Bayern one year ago. Staying around to repair the damage Mölders could achieve legendary status by bombing his team back to professional football. Patrick Schmidt and Kevin Behrens were Saarbrücken’s top strikers this season. 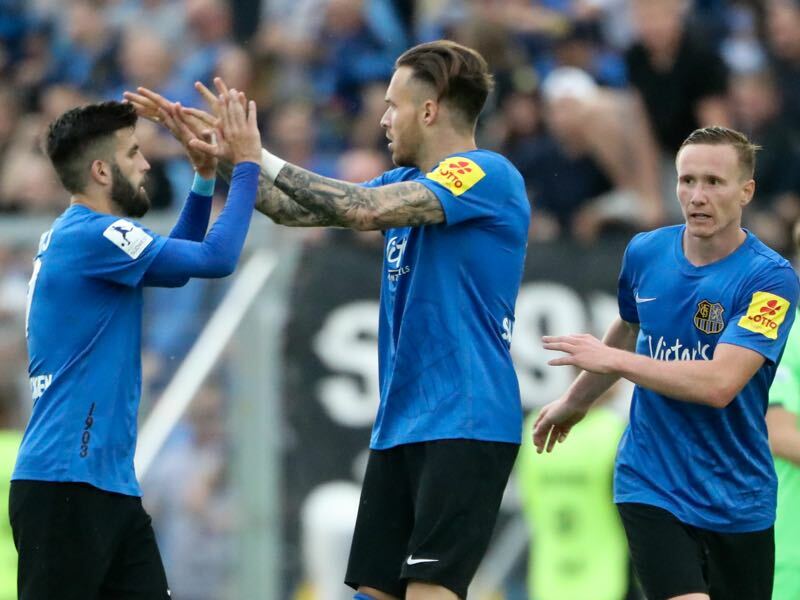 Both scored 19 goals throughout the campaign, but Behrens will miss the second leg against 1860 München after receiving a red card in the first leg. Schmidt did not start in the first leg but with Behrens out will likely feature in the second leg from the very start as Saarbrücken need goals in order to overcome the 2-3 deficit. Regardless, of what will happen on Sunday Schmidt will be promoted at the end of the season as he joins Bundesliga 2 side 1.FC Heidenheim in July. The playoff promotion playoff match on Thursday was the first competitive fixture between the two sides in twelve years. The last time the two teams met was on matchday 33 of the 2005/06 Bundesliga 2 campaign, which 1860 won 1-0 – effectively relegating Saarbrücken to the third division at the time.